The prostate gland is intimately involved in male health. But as men reach middle age, 50% will suffer from an enlarging prostate. Although often benign in nature, this enlargement can impact urinary patterns. Lycopene is an antioxidant carotenoid and potent prostate health nutrient because it promotes healthy prostate size and structure. Boron has been shown to slow the elevation of prostate-specific antigen, and ApresFlex is an ultra-absorbable extract of Boswellia that supports normal inhibition of 5-lipoxygenase, an enzyme that is associated with undesirable cell division changes — both key aspects of maintaining prostate health at the cellular level. Supporting healthy, comfortable urination and inhibiting prostate-related inflammation are essential parts of maintaining prostate health. Graminex Flower Pollen Extract relaxes the smooth muscles of the urethra and helps regulate inflammatory reactions. Saw Palmetto CO2 extract supports normal urinary flow and promotes a healthy inflammatory response as well. Pygeum extract also supports healthy urination patterns. And one of the active compounds in pygeum is beta-sitosterol, which enhances pygeum's effects. This formula contains additional beta-sitosterol (from pine) as well as pumpkin seed CO2 oil to complement the active compounds of both saw palmetto and pygeum plant extracts. As men age, testosterone often converts to estrogen at higher rates. But prostate cells are sensitive to estrogen's effects. 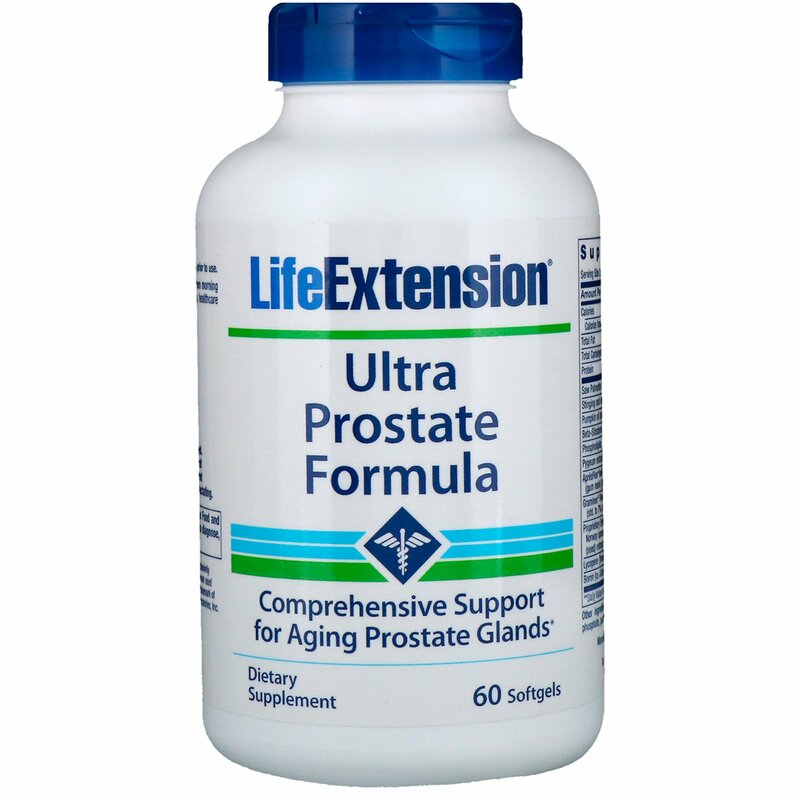 So Ultra Natural Prostate contains powerful ingredients to address the effects of estrogen on the aging prostate. Standardized lignans from flax seed and Norway spruce knotwood convert to enterolactone in the body. 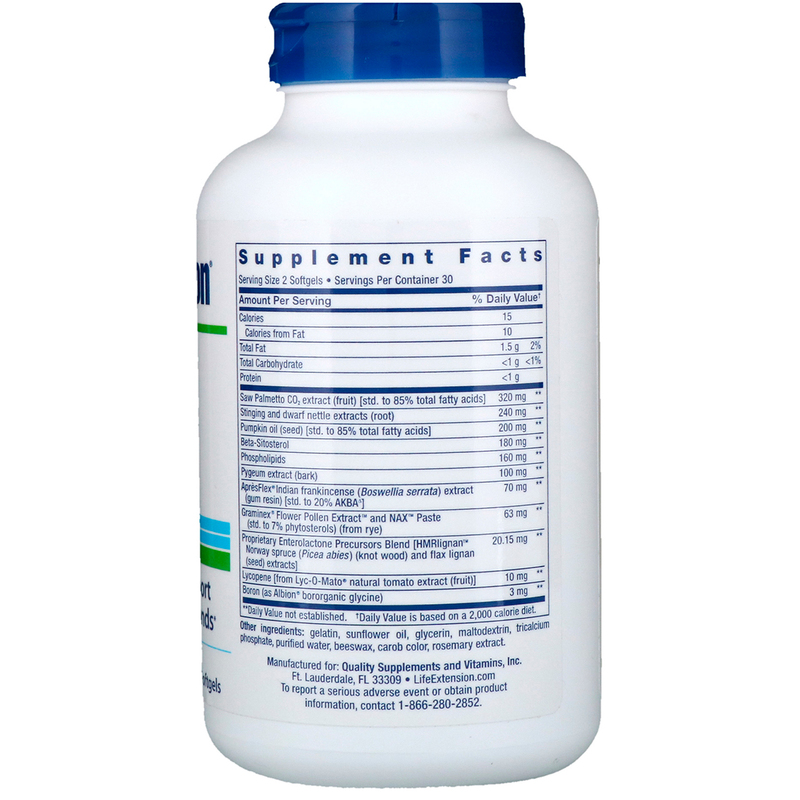 Enterolactone helps support vulnerable prostate cells against the effects of excess estrogen levels. Stinging and Dwarf nettle root extracts help support prostate cells against excess estrogen levels. Simply put, no other prostate health formula delivers this many potent nutrients for male health in a single, science-based formula. Get the next-generation nutrition your prostate needs, and stay healthier, longer. Try Ultra Natural Prostate from Life Extension today! Gelatin, sunflower oil, glycerin, maltodextrin, tricalcium phosphate, purified water, beeswax, carob color, rosemary extract. **Daily Value not established. †Daily Value is based on a 2,000 calorie diet.